A few days ago I jammed a bit with a friend of mine – Thomas Schwarze – in our little home studio. Thomas is a great guitar player and also plays fingerstyle, using a technique similar to the MK style. Our first idea was to play “something” and upload it to youtube. We tried out a few tunes and then attempted to play a rather complex tune – a song I wrote some time ago and recently started to arrange for a proper recording. Unfortunately it did not really happen with this song this day – too many parts and details to get it done properly in a little jam – so we decided to drop the idea of the youtube upload, and just jammed over some of the chord progressions of this song. For some reason we simply let the camera run, and also the audio recording software. When we were watching the result we thought it was not that bad, so we finally uploaded it last week. Most comments on youtube so far were favourable, some people seemed to enjoy the relaxed mood of the tune. For this reason I thought some of you also might want to watch it, so here it is. 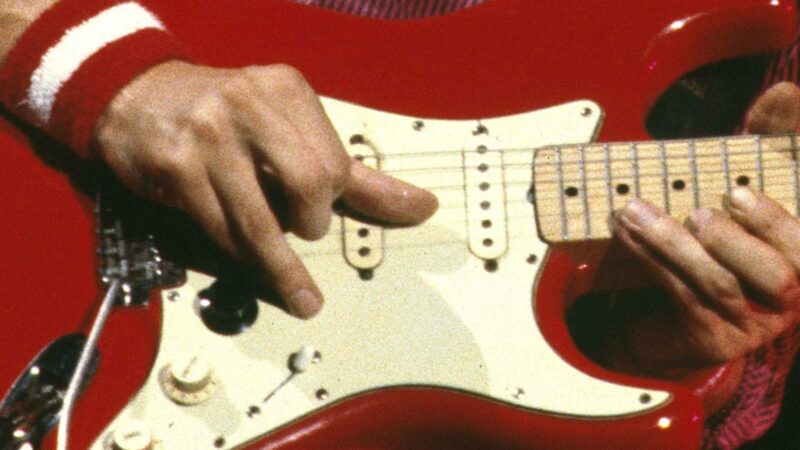 The red Strat I am playing is a “Parts-o-caster”, it is something like a clone of Mark Knopfler’s red maple-neck Strat of early Dire Straits days, consisting of an old Fender neck with a (non-original) laminated maple board, a Japanese vintage body, and a vintage Squier pickguard loaded with the US vintage replica pick-ups of those first Squiers. The amp was a Music Man 212 HD 130, mic’ed with a Shure SM 57. Effects are a Morley volume pedal and the green MXR analog delay. Thomas is playing a Fender Telecaster from the early 70ies, a beautiful guitar that always sounds great, also played through a Music Man amp (a 65-112), mic’ed with an Audio Technica AT 4050.